Soft-Touch Multi-Air drives have a soft foam pad with high performance and extremely long life. The foam layer absorbs any surface difference without cutting the paint layer, maintaining excellent cutting performance to a very high level. In addition, the original Soft-Touch system is designed to provide a solution for every application. 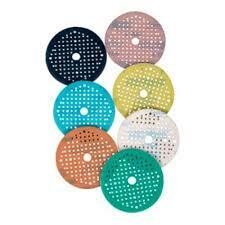 The foam pad is color coded to help identify the disc needed for each grinding operation.